Update: This article was originally published on the 22nd October and has been corrected with new data from Streamhatchet. This chart covers the week commencing October 15th to October 21st. Well hot damn! 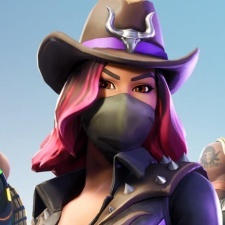 Fortnite has been knocked off the top spot this week. The battle royale has fallen into second place, almost five million hours behind League of Legends. Call of Duty: Black Ops 4, PUBG and Dota 2 are still in the same places as last week. Black Ops 4 is up 27 per cent while PUBG and Dota 2 are down 3 per cent and 14 per cent respectively. 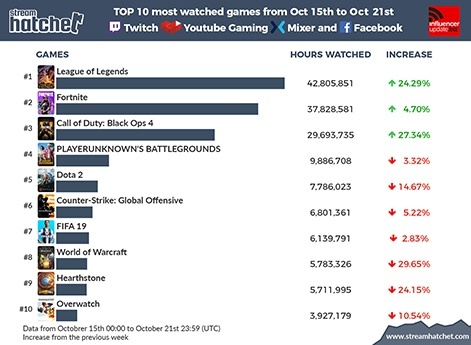 CS:GO is up in sixth place from eighth with another 9 per cent increase in views, pushing World of Warcraft down to seventh. WoW's views have dropped 22 per cent since last week. FIFA19 is still clinging to the chart, this year's installment is in eighth place with a 2.83 per cent drop in views. Hearthstone and Overwatch are bringing up the rear. Blizzard's card game is in ninth after a 24 per cent drop in views, and Overwatch has dropped another 10 per cent this week despite its on-going Halloween event. The chart hasn't moved all that much this week, but expect things to be shaken up with the release of Red Dead Redemption 2, Fallout 76 and new DLC for Spiderman next week.